Lamb's Ear Yarns - Quality yarns and friendly service! Quality yarns and friendly service! Lamb's Ear Yarns is located in the beautiful Lakes Region of central New Hampshire and offers a variety of quality yarns that are produced both regionally and all over the United States, Europe and Peru. 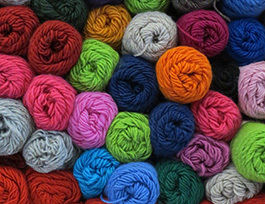 Along with the variety of fine yarns offered, we also provide many different needles, notions and accessories to enhance your craft including books and patterns, classes, expert finishing services and even one-on-one advice based on your knitting level. Stop in and find out how Lamb's Ear Yarns' products and classes can help you with your knitting. Come join us! Welcome to our web site! Feel free to email us with any questions you may have. Check back in early summer for retreat details and the knitting project for 2019. Copyright © 2018 Lamb's Ear Yarns - 3 Waterford Place, Gilford, NH 03249 - (603) 528-4333 - sue@lambsearyarns.com. Product photography by Jackie. E. Bonafide.